Kangaroos/ Koalas are both iconic Australian marsupials. Kangaroos/ Koalas are mainly nocturnal. Kangaroo/ Koala joeys spend long months in the pouch before they're ready to move out. Many animals are endemic to Australia. The koala is a marsupial that feeds on the leaves of eucalypts. 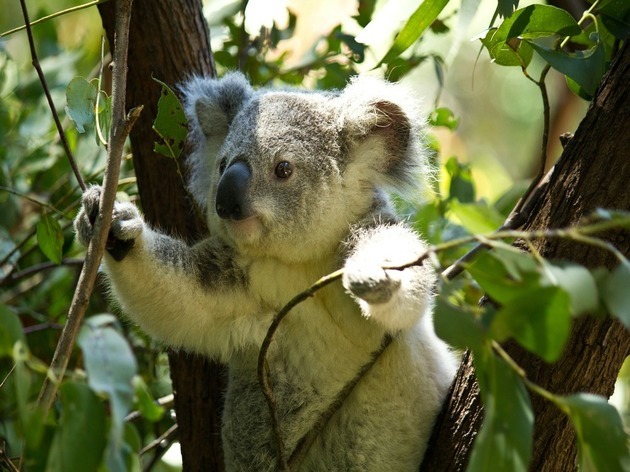 The koala is endemic to Australia and found from south Australia to north-eastern Queensland. Koalas sleep for up to 20hours a day. Koalas are mostly nocturnal. Nocturnal animals are awake at night and asleep during the day. A baby Koala is called a joey. A baby koala looks like a jellybean at birth.It takes several month for the joey to grow, drinking its mother's milk until it first shows its little face to the world. Theduck-billed platypus are the only known monotremes, or egg-laying mammals. Male Platypuses have a calcaneous, sharp spur on each ankle. The spur is connected via a long duct to a gland that produces venom, particularly in the breeding season.